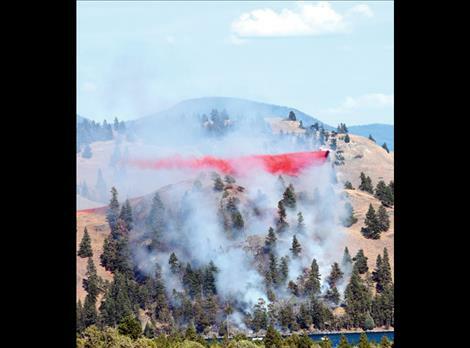 Berl Tiskus/Valley Journal A single-engine airtanker dumps fire retardant on the Wild Horse Island fire July 22. WILD HORSE ISLAND — An illegal campfire is the cause of a five-acre fire that burned on Wild Horse Island State Park last week. The fire started Wednesday, July 22, at about 4 p.m. on the west side of the island. Several agencies responded to fight the fire from both the water and air. No individuals were harmed and nearby structures were saved. The public is reminded that campfires are illegal at all times on Wild Horse Island. State park officials are seeking information on the individuals who may have started the fire. To report suspected violations, and be eligible for up to a $1,000 reward, call 1-800-TIP-MONT, or 1-800-847-6668. For more information on TIP-MONT, visit the FWP website at fwp.mt.gov and look on the Enforcement page.